The City of Richmond recently launched a new public transportation project, the GRTC Pulse. But there's another unique way to get around the city: bikes. Bikes are a must-have in Richmond. The city is just small enough to bike, but just big enough that Willow Lawn to Randolph will take you a 90-minute walk. For this reason, everyone has a bike. (Also, traffic is terrible, so if it were me, I'd avoid driving any way I could.) Bikes are cheap, they're low-maintenance, and they're convenient. They also charge you up with a healthy dose of endorphins before whatever it is you're doing next. Everyone should have a bike. But if you don't have a bike of your own, or if you don't feel like keeping your bike with you all night, there's another option. In a Google-esque twist, Richmond has a bike share program (you know, those silver stations you see everywhere you go.) It's called (shockingly) RVA Bike Share. And I, personally, am an absolute fan of both the concept and its implementation. When I first moved here and saw bike share stations every other block, I knew I was in a cool city. The question is, however, how does it work? Those yellow (or maybe silver) boys lined up looking all fancy are, honestly, a little intimidating. But in another groundbreaking twist of this tale: it turns out the program is as simple as its name. Here's how it works. To use the bikes, sign up for a pass on the RVA Bike Share website (or don't, and just grab a quick $1.75 ride or $6 24-hour pass.) Once you find a bike station, scan your pass, and grab a bike. You can then ride it wherever you need to go, and then just drop it off at the nearest bike station. That's it. In case you couldn't tell from their design, the bikes are electric. Every bike will last an entire day on one charge. When you drop off your bike at the bike station, you're basically plugging it back into the city's electric grid for its next rider. Oh, and they have GPS. Important note: Once you check out a bike, you have 45 minutes to do your thing. However, if you want to ride longer, you totally can. You just, basically, keep riding it past the 45-minute limit. You will get charged for another 45-minute session. The pricing system is, I'll admit, a bit confusing. The first 45 minutes you ride -- so long as every trip you make is under 45 minutes -- is totally free for all pass members. After that, you pay $3 an hour to use the bike. While the annual memberships are $96, you can also do a monthly membership for $18 -- or a seven-day pass for the same price. Alternatively, you can just use them. If you don't have a pass but are in a hurry, you can just hop on a bike. For occasional riders, a one-way pass is $1.75, and a 24-hour pass is $6. That's definitely cheaper than a Lyft. 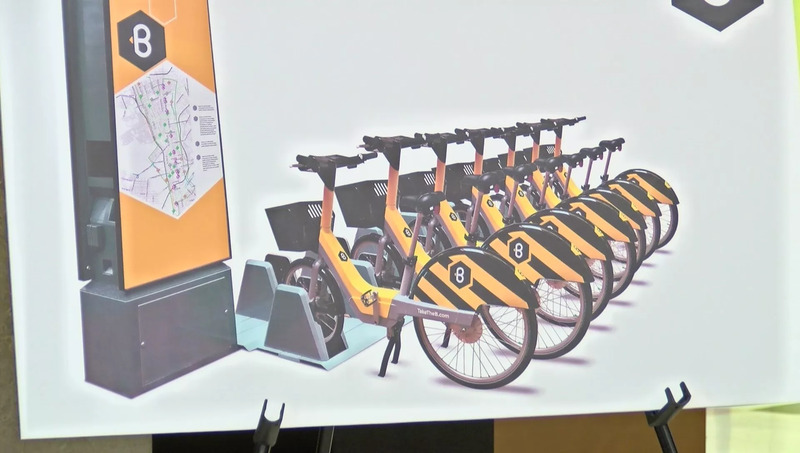 RVA Bike Share -- or as they call it "the B" -- was brought to Richmond by the company Corps Logistics in 2016 for the price of $1.34 million. After two years, it's still going strong. Aaron Dotson, principal and creative direction at Elevation, the firm that adapted the program for Richmond City, is pretty proud of the design, and he hopes you use them. Be fast, guys -- especially if you're running late. Just grab one of those bright yellow electric bikes from the side of the road. Have you used the RVA Bike Share program? Why, or why not? Have you heard good things? Drop some hot takes in the comments below. Check out Richmond's incredible street art scene!